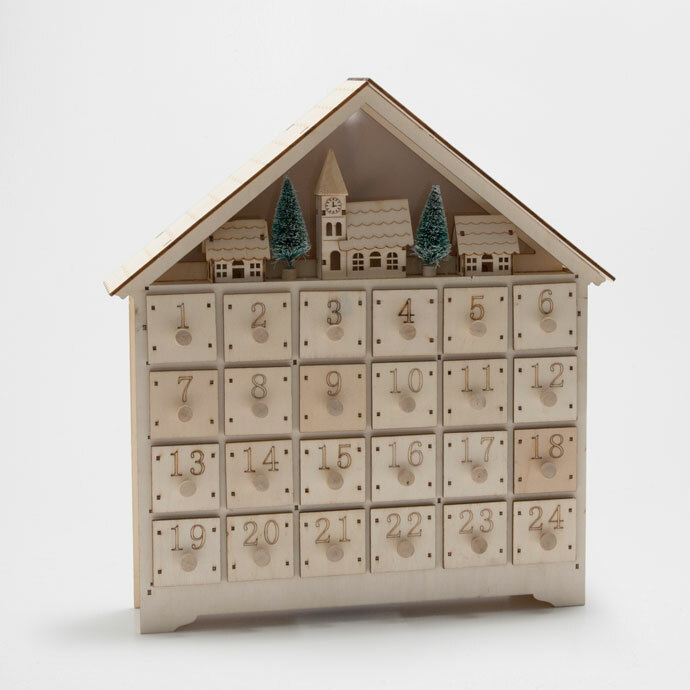 Its not to late to create your own advent calendar! Unless you've been living under a rock for the past few years, you will know that the craze for advent calendars has taken on a whole knew level of Christmas extravagance. It also shows no signs of slowing down. This year I decided I was finally going to buy into the trend and try out one of the popular brand produced calendars. However, after some research I discovered there wasn't really one out there for me. I either loved the brand, but the products within the calendar were something I already had, or I knew the products wouldn't suit me. To be completely honest, some were just way out of my price range. So I suggested to my husband that this year we make our own. I was pleasantly surprised by the offering of calendars on the market, and picked my own up early from H&M (although it is now unfortunately sold out). 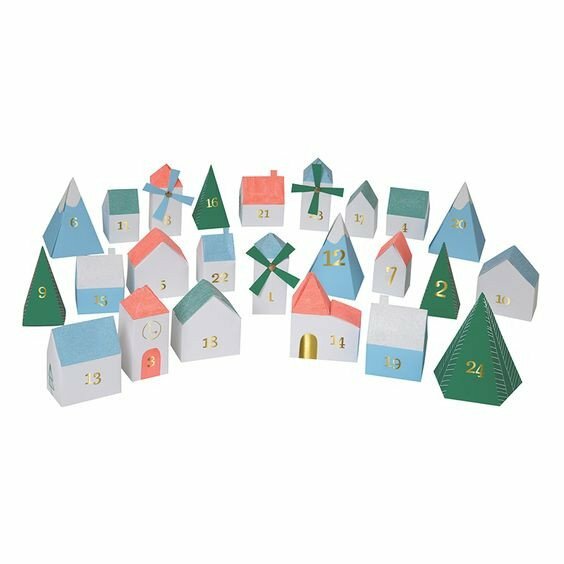 This cute 3D Village Advent Calendar from Moss Cottage is the most affordable out of the two options I found. It would also make a great display, by encorporating them into your Christmas decor. Or, up the fun factor by hiding the little boxes around the house for an added "treasure hunt" element! The second option I've found is a completely different style, it's this very traditional but elegant Square house advent calendar from Zara. As soon as you have worked out your budget it's time to start picking out presents. 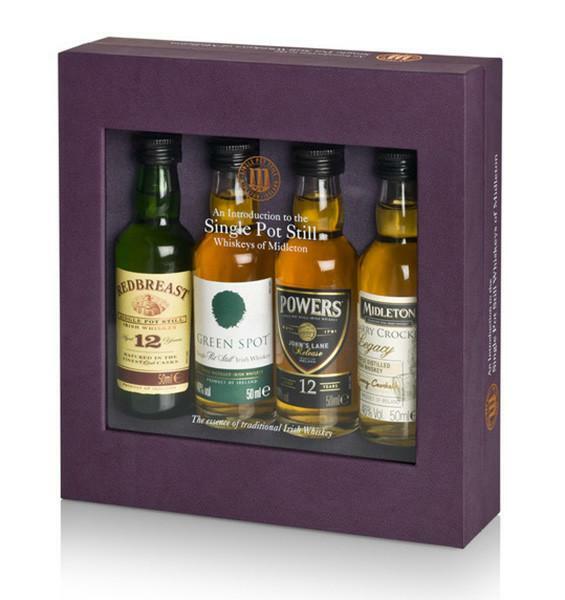 For the men in your life, mini toiletries, food gifts and even scratch cards are a great option for filling their calendar with things you know they will love. For the whiskey drinker, this Jameson's mini set would be the perfect size to divide over a couple of days. Again try to stick to a budget, otherwise it's very easy to go crazy when creating your own calendar. Mini toiletries and bath or skin products are always a great idea. Places like Boots have shelves now dedicated to mini's. At this time of year popular makeup brands such as Benefit (like this Benefit Kissy Missye set) and Mac are bringing out sets of miniatures, this is a great opportunity to pick up a few days in one go. If your budget allows it and your calendar goes up to Christmas day why not add a surprise present in this day. Concert/Cinema tickets, a voucher or something special like a beautiful piece of Juvi designs jewellery. 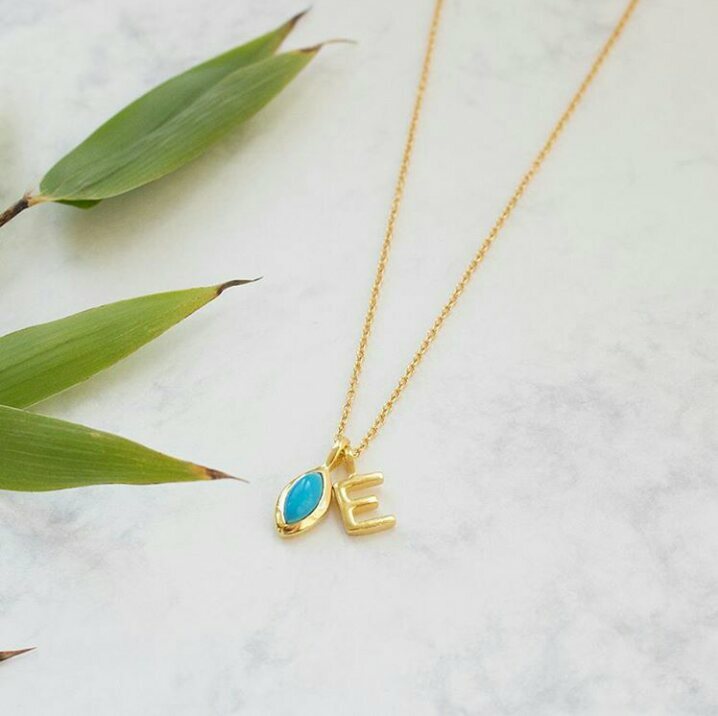 This stunning, personalised and irish made piece would make anyone jump for joy on Christmas morning! If you've created your own advent calendar this year, I would love to hear what you received! Everyone loves a facial right? I know I definitely do! And although I really enjoy a professional one (especially if it's in a beautiful spa) it's not always within my budget. Which is why I've created my own at home alternative that I know is guaranteed to keep my skin happy, as well as my purse strings. Another reason for doing my own facials is because it gives me an excuse for some "me time". I like to do mine on a Sunday, when I feel the stresses of the Monday morning blues creeping in. Sunday is a chance to relax before the week ahead. I would advise that everyone caters their facial to their own skincare needs. I have combination skin and these products really work for me, but if you aren't used to acid exfoliators choose products that you love! To begin my facial I like to properly cleanse. I do this by first splashing some luke warm water on my face, then squeezing out about a coin sized amount of Neroli Daily Brightening Cleanser (Super Facialist by Una Brennan) onto my hands and massaging it into my face, then washing off. At this point I let my face air dry completely before moving onto the acid. I highly rate acid exfoliators for removing dry patches and keeping my skin clear. I apply one every day in my usual skin care routine, but I would recommend building up usage if you have never used any before as they can be harsh, especially on sensitive skins which mine is. Also don't forget to use an SPF after application as your skin can be more sensitive to the sun. 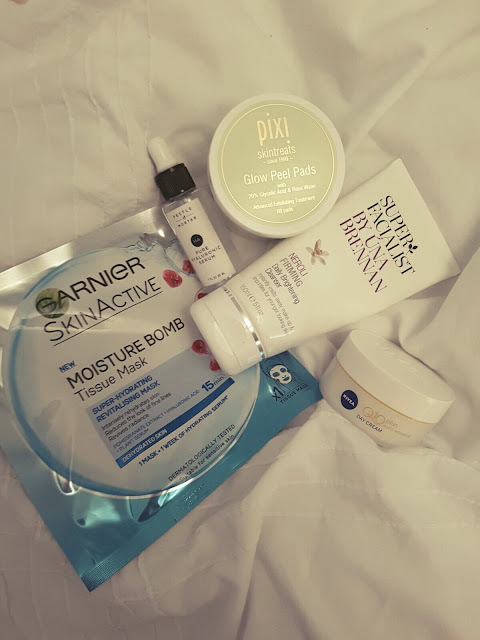 I love love love the Pixi skincare range. 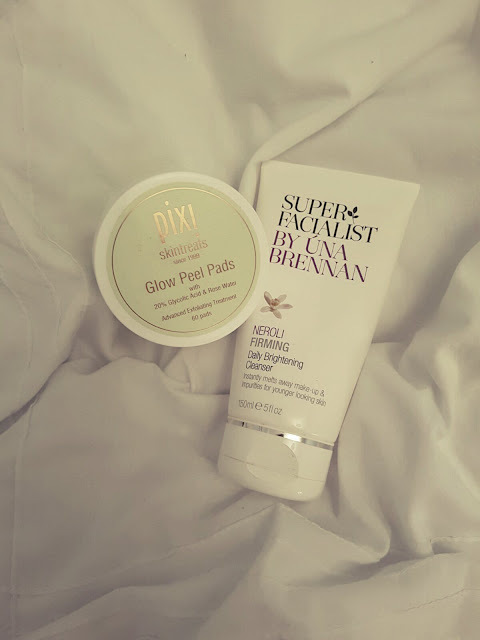 Pixi glow is A-MAZ-ING, a cult product among bloggers and skincare lovers alike; however, I use Glow Peel Pads for ease (and basically laziness) as it's a seriously quick addition to my routine. I basically rub the pre-soaked pad all over my face, around my chin and down my neck using the textured side to get as much exfoliating power as possible. I leave it on for two to three minutes and then bring back my cleanser, squeeze another coin sized amount, and apply it by massaging the product into the face. I then wet a clean flannel with warm water and use circular motions to remove all the product from my face. You may need to rinse and repeat with the flannel to really ensure all the product is wiped off. Next comes the fun bit, choosing your favourite mask. I like to pick one dependant on how my skin is at the time/what time of year it is. 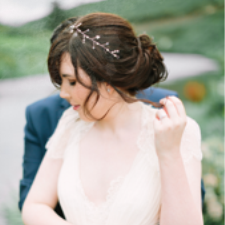 I have to say I know there are mixed reviews out there but I love a bit of Glam Glow. 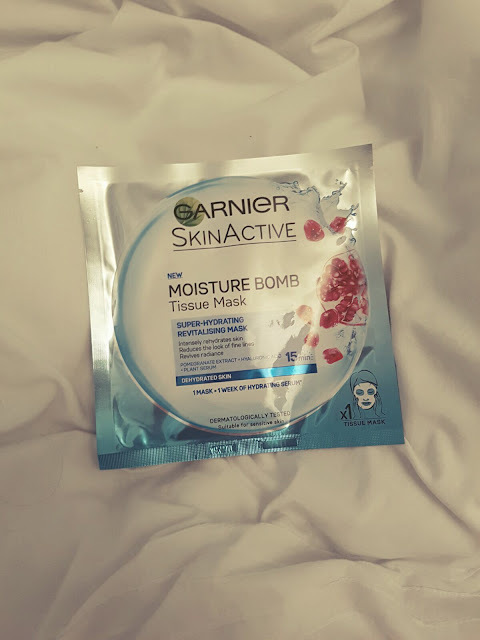 Although a new favourite which is great (especially as we are coming into winter and will need that extra bit of hydration) is the new Moisture Bomb Tissue Mask from Garnier. It's a bit fiddly to put on at first, but I think I have it down to a fine art now. Once on you can feel all the lovely serums sinking into your face. The packing says to rub in any left-over mask but I think unless your applying product the less contact the better so I let any residue product on my skin air dry after removing the sheet. Lastly it's time for the finishing touches. 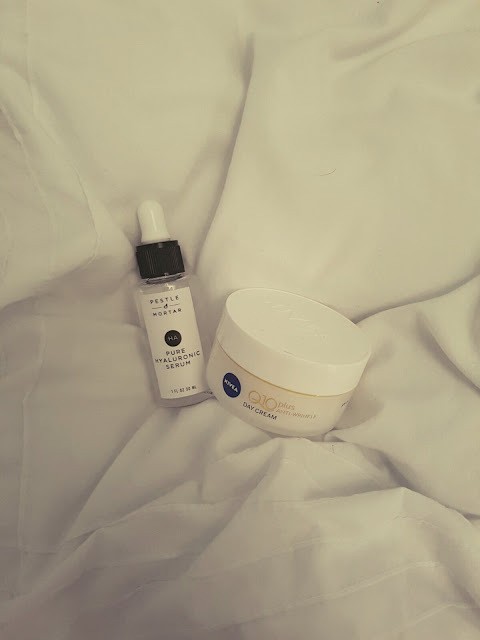 I have a few serums I really like but my favourite of them all (Pestle & Mortar Pure Hyaluronic Serum) was one I only discovered at the start of this year when the lovely Kathryn O'Neill told me it was something I needed to try, she wasn't wrong. I take three or four drops of product and gently pat it onto my skin. I let it absorb, after which I take my trusted cheap and cheerful Nivea Q10 Plus Day Cream and gently wipe it in to finish my perfect at home facial.